MEX2013 - Cuba is the Champion of America! Xalapa, Mexico - The National Team of Cuba defeated Canada, 79-71, to win the Gold Medal of the FIBA Americas Championship for Women. The Cuban player, Yamara Amargo was selected as the Most Valuable Player of the 2013 FIBA Americas Championship. Cuba and Canada traded baskets and the lead on the scoreboard until the Cuban took a lead of 5 points after the first quarter, 20-15 . Both teams showed their best offense and best defense. The Cuban advantage continued to increase during the second quarter, thanks to the great work of Silva Ávila and Clenia Noblet, the advantage was of 9 points. The Canadians responded with a 9-4 run, to decrease the Cuban lead to 4 points (24-28). A basket by Cuban, Yamara Amargo and two baskets by Leidys Oquendo added the teams lead to 10 points (34-24). A triple by Cuban Leidys Oquendo took the advantage to 13 and caused the Canadian coach, Lisa Thomaidis to take a time-out. The score at halftime was Cuba 45 - Canada 30. The Canadians decreased the Cuban advantage to 10 points during the third quarter. The Cubans gambled on offense in the paint, to keep the advantage for the set. The score at the end of the third quarter was Cuba 58 - Canada 47. A basket by Kim Gaucher and another in transition by Justine Colley decreased the Cuban advantage to 4 point, 62-66. The Cubans responded with a basket in the paint by Clenia Noblet and another in transition by Gelis Oyanaisis to take an advantage of 8 points. The Canadian began to commit faults, to send the Cuban players to the free throw line. Cuba remained in the lead, took the win, 79-71 , and the Gold Medal of the FIBA Americas Championship . 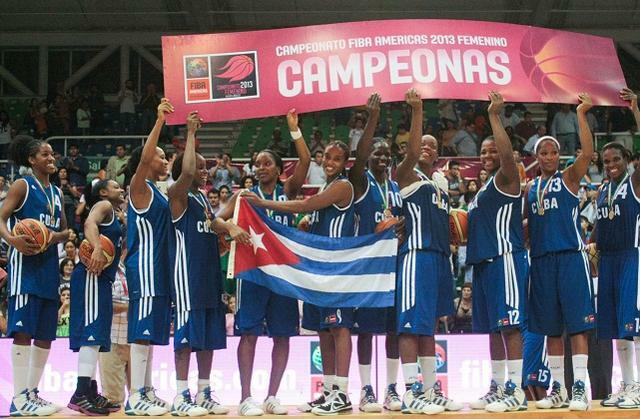 The Cuban player, Yamara Amargo was selected as the Most Valuable Player of the 2013 FIBA Americas Championship. Remarkably, the three medalists from the Championship, Cuba, Canada and Brazil, qualified for the 2014 FIBA World Championship.